The continued burning of coal is literally cooking our planet. Its time to end our addiction to coal and embrace a truly clean energy future. Nuclear power is neither safe nor economically viable. Furthermore, it inflicts many, many future generations with the burden of radioactive waste. Earthlife Africa is opposed to fracking in the Karoo and other parts of South Africa. 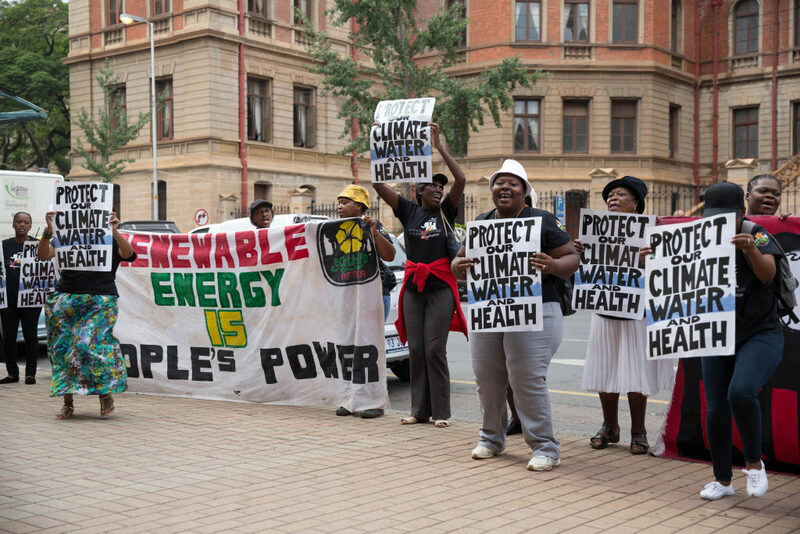 SAFCEI and Earthlife Africa Johannesburg, have launched a court case that challenges the legality of the nuclear procurement process and are asking for everyone’s help. Earthlife Africa is a non-profit organisation, founded in Johannesburg, South Africa, in 1988, that seeks a better life for all people without exploiting other people or degrading their environment. We want to encourage and support individuals, businesses and industries to reduce pollution, minimise waste and protect our natural resources. To be considered for appointment at Researcher/EPO level you should preferably have a masters degree in a relevant social science. We will also, consider applications from candidates who have a strong track record of directly relevant experience, in community-based research, advocacy and development, but do not have the necessary formal qualifications but nearing completion. Verbal and written fluency in at least two languages. 3-5 years of work experience in energy and/or climate change. Strong knowledge of civil society and the environmental sector. Publishing history. Experience in advocacy and media relations. A record of published research in a relevant area or evidence of good research and writing skills. Excellent research, analytical and problem-solving skills. Experience in working with community-based organisations. Contributing actively to all stages of the research process. Coordinating policy and advocacy interventions and related project activities. Preparing and presenting policy and press briefings based on research findings. Representing ELA in public forums. Katowice, Poland – NEWS ADVISORY – Nuclear power is frequently promoted as a necessary solution to global warming, and a key means to achieve emissions goals. This is a major mistake, according to a new report published by the Rosa Luxemburg Stiftung-New York City this week. The report, “Nuclear Power and Climate Action: An Assessment for the Future” (download here: http://www.rosalux-nyc.org/nuclear-power-and-climate-action/) presents an industrial analysis of nuclear energy to assess its viability as a climate solution. From real and practical evidence, the report concludes that nuclear power is not a viable tool in the climate solutions toolbox, and that nuclear-free paths to phasing out greenhouse gas emissions are necessary, feasible, and cost-effective. The report evaluates the technology from all sides: the potential for building new reactors, the prospects for continuing to operate existing reactors, and the commercialization of so-called “advanced reactor designs” in the mid-century timeframe. Analysis shows that nuclear power may not be available in any meaningful capacity by 2050. Existing reactor fleets in most of the world are already reaching the end of their mechanical lives and will mostly phase out within the critical climate timeframe, and strategies to reduce gas reduction must take this into account. With the immense threats of climate change, it is tempting to overlook other environmental hazards in the effort to address it. That is a mistake with nuclear power especially. Nuclear power has major environmental and social impacts, completely aside from those associated with climate change. With the immense threats of climate change, it is tempting to overlook other environmental hazards in the effort to address it. That is a mistake with nuclear power especially, because its environmental impacts are so severe and long-lasting and so many of them intersect with and compound impacts of global warming as well as issues of climate justice. At every stage of its production, nuclear power. From uranium mining to the production of radioactive wastes, nuclear power pollutes the environment with some of the most dangerous, long-lived contaminants in the world and places undue stress on water resources. Because fossil fuels make up 86% of global energy, decarbonization will require a total transformation of energy systems in most parts of the world. Renewable energies have proven to be the most promising option—complemented by investments in energy efficiency, development of complementary technologies, and integrated reliably and resiliently. Evidence from places like Germany and California shows that nuclear power does not integrate well with renewables and phasing it out is likely to create greater opportunities to accelerate the phaseout of fossil fuels and the transformation of the energy system. The report includes case studies showing that promotion of nuclear power entails significant climate opportunity costs, wasting time and financial investments that could reduce greenhouse gas emissions and decarbonize energy systems much more rapidly and cost-effectively. For instance, in the United States, the Summer 2 and 3 reactors were cancelled after major cost overruns and construction delays bankrupted their manufacturer, after $9 billion had already been spent. Had utilities invested in energy efficiency and renewables, the report finds, the utilities would have made substantial reductions in emissions and reduced electricity costs for their consumers. Similarly, the state of New York in the US decided in 2016 to subsidize four aging, uneconomical reactors, at a projected cost of $7.6 billion by 2029—three times as much as will be spent to achieve 50% renewable energy standard in 2030. Had New York invested in energy efficiency instead of nuclear, it could achieve greater emissions reductions in 2030, at a cost reduction of $10.6 billion. The report concludes that the primary obstacles to rapidly phasing out fossil fuels and greenhouse gas emissions are political, not technological or economic. In particular, deceptive interventions by corporations invested in fossil fuels and nuclear energy have engendered inertia and confused the debate by, alternately, denying the reality of global warming and by presenting false solutions. Mitigating the economic and social impacts of climate action by ensuring a just transition for workers and impacted communities is key to charting a clear vision and building and sustaining the political will to accelerate emissions reductions and the phase-out of greenhouse gas emissions. to clean, safe, carbon free renewable energy to combat climate change. immediately stopping investments in coal-based electricity generation. Bank, Nedbank and ends at Eskom Regional Office in (Smit Street) Braamfontein. scenario will even continue to cause human deaths. standards is violating South African citizens’ rights to the right to breathe clean air. Today – almost exactly a year to the day since winning the nuclear court case – it was announced that the two women who were the driving force behind the victory, will be awarded the prestigious Goldman Environmental Prize in San Francisco, USA. In just a few hours, Earthlife Africa-Johannesburg’s (ELA-JHB) Makoma Lekalakala and Liziwe McDaid from the Southern African Faith Communities’ Environment Institute (SAFCEI) will join the winners from five other continents and be honoured for their efforts to successfully mobilise South Africans against the government’s secret R1-trillion nuclear deal. Through their passion for justice, the environment and for the country, these grassroots activists courageously led a broad coalition of likeminded citizens and NGOs, to successfully expose government’s unlawful and unconstitutional nuclear deal with Russia. At a time when high-level government corruption was at its peak – with the nuclear deal taking centre stage – this landmark legal victory not only served to protect South Africa from lifetimes of nuclear waste, but also restored some faith that justice was still possible in South Africa. Says Lekalakala, Director at ELA-JHB, “The nuclear deal was (and potentially still is) a major threat to the livelihood of South African citizens and our quality of life. There are other ways of generating energy, ways that are clean and affordable, and puts the power in the hands of the people. It is important, for our sustainability, that we start thinking differently about how we satisfy our energy needs. It is not sensible to think that what used to work in the past, can still apply now, particularly since the evidence is overwhelming against nuclear technology and fossil fuels.” Lekalakala divides her time between her home in Johannesburg and the Earthlife satellite office in the Limpopo province, where pollution from power stations and coal mines has contaminated local communities to such an extent that farmers can no longer safely grow crops. Says McDaid, Eco-Justice Lead at SAFCEI, “The risks with nuclear are just too high. I believe that if people have the facts, they will choose differently. This is what we are doing through our campaigning. For example, there is so much we don’t know about the future impacts of nuclear waste, which continues to grow every year. Koeberg alone generates approximately thirty (30) tons of high level waste per year – all stored at the plant. Furthermore, the Chernobyl disaster, which happened 39 years ago this week, and Fukushima still continue to provide evidence of the enormous risks of nuclear.” McDaid is based in Cape Town and has been campaigning against nuclear energy for decades, thwarting previous attempts by South Africa to develop a nuclear industry. Both women agree that it was through the partnerships forged with other NGOs and civil society organisations (CSOs) – which resulted in mass grassroots mobilisation – that was pivotal to the court case win. The court case in turn, brought the nuclear deal out into the open and more and more citizens began connecting the dots. For both Lekalakala and McDaid, the anti-nuclear campaign only forms part of their work. Lekalakala also works on the Life After Coal campaign, which discourages the use of coal for energy generation, but rather advocates for the just transition to renewable energy systems for the people. McDaid, on the other hand also co-founded The Green Connection, an NGO working to empower people to participate in their environment to promote truly sustainable development. “SAFCEI and ELA-JHB are small environmental organisations, which through the knowledge and experience of Makoma and Liz, realised the threat and depth of corruption of the nuclear deal, and took the South African government to court, and won, against all odds. It was a victory of Dave and Goliath proportions. Makoma and Liz’s personal commitment and actions went the extra mile to promote the constitutional rights of South African citizens, and we are thrilled they are being honoured in this way. The message we want to share to the world is that Africa does not need nuclear energy,” adds de Gasparis. Last year’s Africa winner, Rodrigue Katembo from the Democratic Republic of Congo, was awarded the prize for putting his life on the line by going undercover to document and release information about bribery and corruption in the quest to drill for oil in Virunga National Park. The resulting public outrage forced the company to withdraw from the project. In the past week, the Life After Coal Campaign (which comprises: the Centre for Environmental Rights (CER), Earthlife Africa, and groundWork) has instituted fresh court proceedings against the Minister of Environmental Affairs in relation to the proposed Thabametsi independent power producer (IPP) coal-fired power station . The Campaign has also made further written and oral objections against both preferred bidders under the Coal Baseload IPP Procurement Programme (being Thabametsi, as well as the proposed Khanyisa coal-fired power station) to the National Energy Regulator of South Africa (NERSA) – during public hearings hosted by NERSA on 27 March 2018 . Earthlife Africa and groundWork, represented by the CER, instituted the High Court review proceedings on 26 March 2018 to challenge the Minister of Environmental Affairs’ decision of 30 January 2018 to uphold the environmental authorisation for the proposed Thabametsi coal-fired power station. The Minister made her decision after considering Thabametsi’s climate change impact assessment, which she had been ordered to do by the Pretoria High Court in the first Thabametsi court challenge judgment of March 2017. Despite the staggering climate impacts of the plant, as demonstrated in the climate change impact assessment, the Minister decided that the high impacts could be justified by the need for additional capacity as set out in the Integrated Resource Plan for Electricity 2010 – 2030 (“the IRP 2010”). the Minister’s conclusion that the benefits of Thabametsi outweigh the climate change harms was unreasonable and irrational, in light of the evidence available to the Minister (or which could have been available, had she made proper enquiries). groundWork and Earthlife Africa have sought an order setting aside the Minister’s decision and referring Thabametsi’s authorisation application back to the Department of Environmental Affairs for reconsideration. They have also asked for an order confirming that the National Environmental Management Act and the Constitution require competent authorities to consider site-specific climate change impacts associated with proposed projects; and that they do not permit competent authorities to rely blindly on the IRP 2010 and other policies or Ministerial determinations as determinative of their decision. As Makoma Lekalakala of Earthlife Africa points out, “it is unacceptable that a plant with such irreversible impacts could be justified by an outdated energy plan which does not reflect the current reality in South Africa – namely that we have excess capacity and that new coal plants are simply too expensive”. Thursday, 19 April 2018 is the deadline for any notices of opposition – from respondents seeking to oppose the review – and for the record of documents that were before the Minister when she made her decision to be filed with the court. Last week CER, groundWork, Earthlife Africa, and representatives of community-based organisations  also made oral and further written objections to NERSA, opposing the generation licence applications of Thabametsi and Khanyisa. They argued that licensing Thabametsi and Khanyisa would not be in the public interest, as these plants will have significant impacts on human health and the environment and – importantly – that these additional coal-fired power stations are not needed (given that South Africa has surplus capacity) and will cost South Africa more money than feasible alternatives. “NERSA is legally obliged to make decisions which are in the public interest and in line with the Constitution. This means that NERSA has a duty to uphold and protect the Constitutional right to an environment not harmful to health and wellbeing” says Nicole Loser, attorney at the CER. There was widespread objection to the licensing of the coal IPPs, from a variety of stakeholders, including from Eskom, which argued that these power stations would place undue financial pressure on Eskom and South Africa. Jesse Burton of the Energy Research Centre (ERC) showed that, according to modelling conducted by the ERC, the coal IPPs would cost South Africa up to an additional R4 billion annually – this cost will ultimately be borne by the consumer. “Clearly, on this basis alone, licensing the 2 coal IPPs would not be in the public interest. We also know that these power stations will have devastating impacts for our climate and human health.” says Rico Euripidou of groundWork. However, at the hearings, both ACWA Power Khanyisa Thermal Power Station RF (Pty) Ltd – with partners General Electric and Palace Group – (the developers of the Khanyisa project) and Thabametsi Power Company (Pty) Ltd (the developer of Thabametsi) sought to convince NERSA that the power stations are, in fact, environmentally-friendly and beneficial to the people of South Africa. The Life After Coal Campaign has asked NERSA to hold public hearings in the affected areas where the power stations will be built – namely Lephalale (Thabametsi) and eMalahleni (Khanyisa) – to ensure that the licensing process is fair and enables participation by those who will be most affected by these plants. It is not known when NERSA will make a finding on the licence applications, or when and whether NERSA will hold further hearings in the affected areas. The Campaign will continue to oppose all proposed coal-fired power stations, which are unnecessary, expensive, highly-polluting, and disastrous for the climate. Here is the notice of motion, and founding affidavit. Here are the NERSA objections (Thabametsi: part 1, part 2; and Khanyisa) and presentations. See Promise Mabilo of the Highveld Environmental Justice Network making objections to NERSA against the proposed Khanyisa power station https://www.facebook.com/groundWorkSA/videos/2406245479401512/. 1. We address you on behalf of the Life After Coal Campaign (consisting of the Centre for Environmental Rights, Earthlife Africa Johannesburg, groundWork), and Greenpeace Africa. We write to thank you for our meeting on 5 December 2017 and briefly to record some of the key points from our discussions. 2. You indicated in the meeting that you regarded the IRP not as a policy, but rather an operational plan, related to implementing already existing policy. You indicated that you view the National Energy Act of 2008 as the applicable policy. 3. You advised us that “everything” had been put on hold pending the finalisation of the IRP. We understood this to mean that all energy procurement processes were on hold. However, you indicated that a decision had been made on renewable energy independent power producers bid windows 3.5 and 4 and this would be announced by the President this Thursday, 7 December 2017 (today). baseline, and the same process was not necessary for the IRP2016, on which, in your view, there had been adequate public participation. Although we were not able to elaborate further on this in the meeting, we confirm that we believe that the level of consultation on the IRP2010 created a precedent in terms of what constitutes adequate public participation, and that we believe it is inadequate to only seek input from the public on the most initial of the models and scenarios. Moreover, such consultation as has taken place was only conducted in bigger urban centres to the exclusion of many communities directly affected by the IRP, such as mining-affected communities, and communities affected by air and water pollution from coal-fired power stations. 5. You advised us that all energy sources will be in the IRP (we take this to mean the sources listed in the IRP2010, namely natural gas, hydro, landfill, pumped storage, coal, wind, solar PV, CSP, nuclear, and diesel), but that the allocation of these sources would be proportionally reduced in the IRP, because of reduced demand for electricity. You indicated that there would be “devastating” impacts if any energy source were excluded; that the game needed to be fair, with a “level playing field”, and you were the referee. You said that the “mantra” was that all energy sources must comply with pace, scale, affordability, and environmental requirements. Energy policy is, you advised, based on what we have available to us, and policy could not be changed. Although we were not able to respond to this in the meeting, the evidence is clear that the socio-economic and environmental impacts of some energy sources (coal, nuclear and gas) are significantly higher than others, and after decades of subsidies for coal and nuclear, the playing field is anything but level, particularly in terms of renewable energy. 6. In relation to coal in particular, you advised that coal should not be shut down entirely, but that it should rather use technology like carbon capture and storage (CCS) to ensure compliance with environmental standards. Although we were not given the opportunity to raise this at the meeting with you, we must point out that thus far major polluters such as Eskom and Sasol have strongly resisted complying with air quality standards, and that CCS has, to date, not been feasibly implemented, nor is it cost-effective. The South African Centre for Carbon Capture and Storage (SACCS), a sub-body under the South African National Energy Development Institute (SANEDI) has, to date, not been able to identify a possible suitable site even to pilot the storage of carbon dioxide. 7. In relation to nuclear energy, you indicated that this was the “best option”, but that nuclear waste had to be managed. You indicated that where other countries have had nuclear accidents, there was evidence as to why this had happened. Again, although we were not given the opportunity to respond to this at the meeting, we believe that one cannot underestimate the risk of a nuclear accident in South Africa, and its potentially catastrophic social and economic impacts. The potential for human error combined with nuclear technology means that nuclear is never safe. 8. You commented that, for renewable energy, it is a technology type that is variable – there is not always enough sun and wind and that dust particles in wind – and the wind blowing at the wrong speed – could destroy the turbines. Again, although we were not given the opportunity to respond to this at the meeting, based on extensive scientific research and modelling undertaken by reputable research institutions, we do not agree with this assessment. 10. You advised that the Energy Indaba was a meeting for labour, business, and government to discuss how to reinvigorate the struggling economy and address unemployment. At this meeting, business and bankers would sit together and determine how to ensure investment to promote the sector. You clarified that the indaba is not to discuss the IRP or any energy-related policy as this is before Cabinet. You told us that we had incorrectly assumed that we had been invited to the indaba. 11. On 6 December 2017 at 20h05 – the evening before the Indaba – Robyn Hugo of the CER received an invitation to attend the Indaba, with a registration form, but no agenda. None of the other representatives of the organisations who attended the meeting with you on 5 December 2017 have subsequently received invitations to the Indaba. 12. You indicated that you wished to have a broader civil society discussion in the beginning of next year – after 8 January 2017 – which includes all of the community-based and non-governmental organisations in the sector, and you look forward to a constructive engagement. 13. While we are always prepared to engage with the Minister and Department of Energy on issues of concern, we need to be clear that such commitment to engagement does not exclude our rights to access other strategies, including legal proceedings and peaceful protest, to pursue lawful energy policy that give effect to constitutional rights. In this regard, we attach for your attention our 31 October 2016 statement “No room for secrecy: environmental organisations publish minimum requirements for SA’s overdue Integrated Resource Plan for Electricity” and our 9 November 2017 statement “What we expect from SA’s Integrated Resource Plan for electricity”, setting out what we regard as the minimum requirements for the IRP. and http://m.engineeringnews.co.za/article/new-csir-model-points-to-renewables-led-electricity-mix-by-2050-2017-11-16/rep_id:4433 . The CSIR also did the system analysis which was used for the Meridian Economic study’s reference scenario – and found that in a 34 year, least cost optimised, power system operation and expansion plan, no new coal-fired power capacity is built after Kusile, and no new nuclear plant is built either. It states, “new coal and nuclear plants are simply no longer competitive. When new capacity is required, demand is met at lowest cost primarily from new solar PV and wind”. Furthermore see https://arxiv.org/pdf/1710.11199.pdf . This study by the Frankfurt Institute for Advanced Studies at the Goethe-University in Germany, provides independent confirmation of the CSIR findings regarding the least-cost electricity mix for South Africa. It finds that an electricity system based on wind and solar PV can supply electricity demand at 10%-30% more cheaply than based on new coal and nuclear – this is the case even when investments in the grid and transmission of electricity are taken into account. 2 A study by Grové Steyn, Jesse Burton, Marco Steenkamp, 15 November 2017, available at http://meridianeconomics.co.za/wp-content/uploads/2017/11/Eskoms-financial-crisis-and-the-viability-of-coalfired-power-in-SA_ME_20171115.pdf . 14.6. the long-term energy vision for South Africa. 15. We ask that you respond to these by 15 December 2017. We also confirm that no response has been received to the open letter from civil society dated 28 November 2017. We look forward to your response also to this letter by 15 December 2017. 16. Please note that, given the far-reaching national importance of the issues discussed and the fact that we are public interest organisations committed to transparency and accountability, we are placing this letter in the public domain.